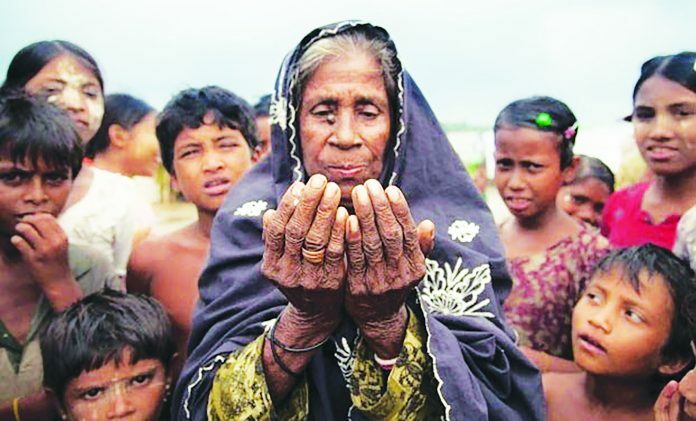 Rohingya Muslim woman prays for relief from oppression as children look on. Over the past several weeks, radical Buddhist Monks, in cooperation with Myanmar security forces, have mercilessly slaughtered countless Rohingya Muslims in Myanmar, formerly Burma. Well over 400,000 have fled the violence, seeking refuge in Bangladesh. Several thousand others have been murdered, have drowned, or have died while attempting to flee. Countless others remain in hiding, sheltering in forests. members of the United Nations. Ironically, the de facto leader of Myanmar is Aung San Suu Kyi, a former winner of the Nobel Peace prize. Other former Nobel Peace prize winners, in addition to the Dalai Lama, have spoken out against Kyi for her astounding silence and indifference during this ordeal. such as healthcare, as well as livelihood opportunities. Physicians with Doctors Without Borders have previously been expelled. Further restrictions include limitations on education, employment, travel and marriage. Worse yet, other Rohingya live in modern day concentration camps, a story previously documented by Nicholas Kristoff of The New York Times. deteriorated over the past several months, and provided resources on the ground, it has stood idly by and done nothing to stop or deter Myanmar security forces from persisting in their oppression and ethnic cleansing. Article 42 of the United Nations Charter gives the Security Council the authority to take action as may be necessary to maintain or restore international peace and security. Accordingly, the United Nations has previously authorized a limited use of force by UN peacekeeping operations in some instances, while in other instances, it has authorized the use of “all necessary means” or “all necessary measures” by multinational forces (such as in Rwanda, and in Bosnia and Herzegovina). How much more blood must be shed before the UN sends a peacekeeping force to Myanmar? How many more villages need to be burned? How many more women need to be raped? How many more children need to be dumped in mass graves? Myanmar for “systemic brutal acts.” However, these hollow words fall short of the moral and religious obligations that are incumbent upon those who have the capacity to do otherwise. It is the duty of the entire Islamic world to bring an end the genocide against Rohingya Muslims! We demand that the governments of Muslim nations, in conjunction with the United Nations, immediately take the necessary measures to end these atrocities. If this lassitude persists, then we will find it incumbent upon ourselves to establish an international organization to be the voice of the voiceless.